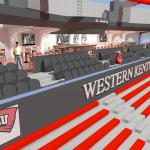 This project at Western Kentucky University’s Diddle Arena Member’s Club involved a partial renovation of the top section of the arena to add more premium seating. 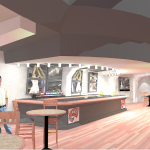 It also included a club seating area on the mezzanine. 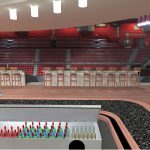 To accomplish this, four rows of bench seating would be removed, and two rows of chairs, a drink rail, tables, and lounge seating would be added to a permanent riser. The project also includes audio/visual enhancement for this area of the arena. Although this project was never completed, due to budget cuts and the economic downfall of 2008, our team still gained the experience of working with a higher education client and designing/rendering a higher education project.